Chip giant Intel is holding its annual developers conference in San Francisco next week. The event will feature the first big keynote speeches by its new CEO, Brian Krzanich, and president, Renée James. They will likely contain the first big hints of any shifts in direction or emphasis. Intel has spent this week quietly setting the table in advance of IDF. Yesterday saw a big release of a new generation of Atom chips aimed at servers used in data centers. The new chip, the Atom C2000, comes in 13 flavors and is being aimed at micro-servers like HP’s Project Moonshot. It’s a step toward the redesigned server racks that Intel and some of its partners envisioned earlier this year. Analysts were torn over whether or not they like it. Doug Freedman of RBC called it a “compelling offering,” while Hans Mosesmann of Raymond James suggested it was a desperation move intended to defend Intel’s position in the data center from new server chips based on designs from British chip-design firm ARM. Shareholders seemed to like it. Intel shares rose by more than one percent to close yesterday at $22.64 a share, and the shares are up about 10 percent since the start of the year. Today, Intel shares are giving back some of that gain, and as of 11:30 am ET, had fallen by about 14 cents. Away from the data center, there’s the ugly question of personal computers. With the global market for PCs still dragging through a trough of historic proportions, Intel CFO Stacy Smith gave an interview to The Wall Street Journal, saying that the PC has “died half a dozen times” already. Smith was reiterating a marketing message that Intel teed up earlier this month. Backed by a study from research firm IDC, Intel argued that there has never been a better time to buy a PC, and that consumers are getting ready to start doing just that — if for no other reason than that their current machines are getting so old that they’re too frustrating to use, and that as good as they are, tablets just don’t to everything a PC does. But the emphasis is likely to be on Intel’s biggest weakness, which is mobile. At the moment, Intel is nearly nowhere in the smartphone business. Mike Bell, the company’s vice president and general manager for new devices, readily admitted this at our D: Dive Into Mobile conference in New York earlier this year. The picture in tablets is somewhat better, but that’s not saying much. So, next week you can expect to see Intel make its latest moves in an effort to peck away at the commanding lead in the mobile market that ARM-based chips have built up. There will be a lot of talk about Bay Trail, the code name for a new generation of mobile chip that is both a more powerful computing engine and better at managing power consumption than before, and which takes advantage of Intel’s best-in-the-world chip-manufacturing prowess. 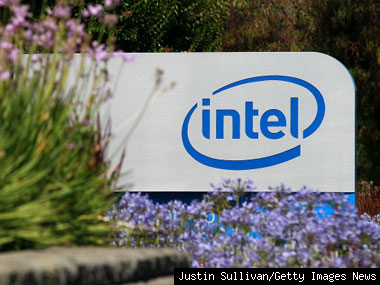 The early buzz suggests that several Intel customers will announce that they are using its chips in new tablets and phones. But the bigger question is whether or not any of them will be devices that anyone wants to buy. Time was that Intel’s marketing machine — remember Intel Inside? — was a significant component of the fuel that propelled the personal computer industry’s growth. For years, Intel rounded out the Top 5 of the Interbrand list of the top global brands, mainly on the strength of its PC marketing efforts. The top of the 2012 list was heavy with technology names. Apple was No. 2 after Coca-Cola, followed by IBM, Google and Microsoft. Where was Intel? No. 8. Its placement on that list says a lot about where Intel ranks in the overall technology discussion right now. Once an agenda-setter, it’s looking like it has lost a good deal of its old swagger. We’ll see next week if the new generation of leadership has any hope of getting some of it back.